Many shooters prefer the original ‘classic’ configuration of the K-80 Trap. The K-80 Trap has a fixed, taper step or taper flat rib. Many stock and barrel options are available along with your choice of receiver engraving. The barrel features a 12mm taper step rib, a 12-8mm tapered flat rib or a 10-6mm narrow tapered rib for improved pointing yet retained elevated profile that places the eye above the clutter at the breech end. Additional work in the muzzle area had given these barrels a much improved weight distribution. To compliment the barrels we use a lighter than normal front hanger that save important grams right on the muzzle. We offer this in conventional blued steel or pure titanium. It should be noted that the titanium version is a full 5 grams lighter than even the skeleton steel version although for some the more conventional appearance of the steel hanger is preferred. The Trap, as standard, is fitted with an adjustable comb stock to allow the owner to fine tune the gun fit. Each new K-80 comes with 10 years warranty and backed by our excellent Krieghoff Service, offering advice, service and repairs for the complete Krieghoff range. 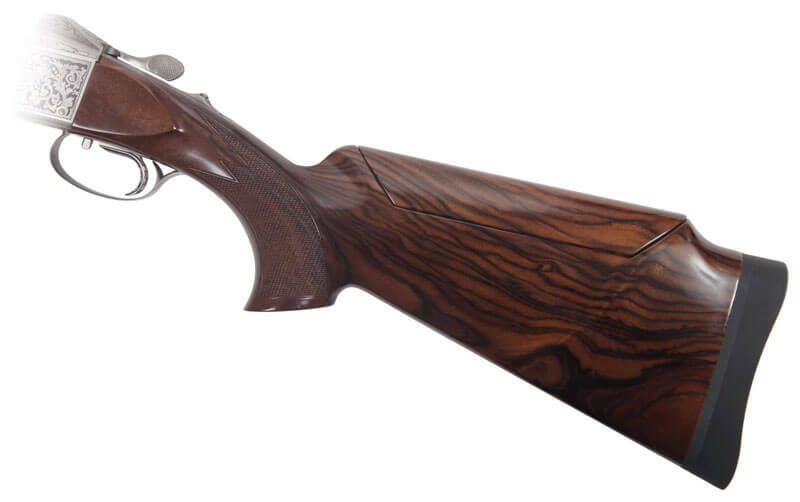 The legendary reliability of the K-80 brand, backed by our service centres Worldwide, makes the K-80 Trap the perfect choice for this demanding sport - truly a Professional Competition Shotgun. Length of Pull (Center) - 378mm / 14 7/8"
Length of Pull (Heel) - 384mm / 15 1/8"
Length of Pull (Toe) - 391mm / 15 3/8"
Length of Grip - 100mm / 3.93"
Drop at Monte Carlo - 54mm / 2.13"
Drop at Heel - 40mm / 1.57"
Cast at Heel - 5mm / 0.20"
Cast at Toe - 6mm / 0.24"